There's a problem your WMV file is too big for emailing or uploading. Or worse still, Your limited amount disc space in your mobile device cannot hold any larger WMV files you want to input anymore. So a top priority is to shrink WMV and get a new file with smaller size. So how to compress a WMV file? It won't be simple if you choose a wrong tool. As many users encountered problems, we gather common issues and solutions, as well as tips on how to losslessly downsize WMV file to a high-quality video with smaller size on Windows and Mac. Working at 16X faster speeds, MacX Video Converter Pro helps to compress large WMV file to smaller-sized FLV, MP4, MOV, etc yet get the same quality of videos as the input. Also comes with excellent WMV video editor and parameter adjuster to trim/crop/edit WMV videos, tweak resolution, bit rate to output smaller sized WMV. Knowing some basic info about WMV helps you better understand how to compress WMV file. WMV (Windows Media Video) is a video format designed for streaming apps and developed by Microsoft. Using software like 7zip, winrar to zip WMV files won't knock down WMV file size a lot. WMV video reducer program is a nice choice to shrink WMV file size by changing image size, adjusting video resolution, lowering video bit rate, frame rate and converting WMV to MP4 or other format with smaller file size. 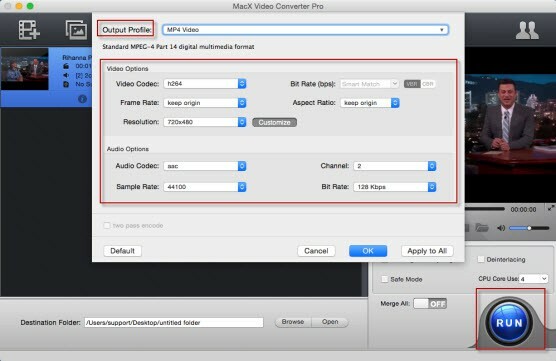 MacX Video Converter Pro allows you to compress WMV file to smaller-sized MP4, FLV, MOV, AVI, etc. for emailing or sharing on YouTube Vimeo. Also, the 350+ readymade preset profiles for mobile devices enable to one-click resize WMV for playing on iPhone X/8/7/Plus, iPad Pro, Android mobiles and more without occupying too much space of your devices yet making a perfect balance between video quality and size. Best of all, it can accomplish this task at 5X faster speed compared with other rivals, thanks to its High Quality Engine, Multicore CPU, and Intel QSV/Nvidia/AMD Hardware acceleration tech supports. Additionally, it is a solid video editor to trim WMV to get favorite parts, cut off the file to delete the black bars, and even add subtitles to WMV file. Meanwhile, it's at your fingerclicks to lower the resolution or bit rate of WMV file to get it at smaller size. You won't spend much time studying the user guide, it is very easy to decrease large WMV file size. Free download the WMV video reducer or get the Mac version, and launch it on your computer. Hit "Add File" icon to load WMV file. Choose the output format from a drop-down list. Generally, you can decode WMV to FLV to achieve smaller file size, especially when you need to upload large WMV to YouTube. You can choose to compress WMV to MP4 format as MP4 takes up less space, outputs high quality makes good compatibiity with mobiles. So just select "MP4" as output format from "Output Profile" menu to change WMV to MP4 format with smaller size. It is also possible to change WMV to MOV, AVI, MKV, FLV, 3GP, MTS, MP3, AAC, to name just a few. Click "Edit" button to enable the features of trimming, cropping and expanding to remove black bars, unwanted parts of the video, which helps a lot in compressing WMV file size. Click Settings icon on the right. And you will find it become a useful video resolution converter to change resolution from 4K 2160p to 1080p, 1080p to 720p, etc. Lower the frame rate, bit rate and resolution to downsize WMV. Note that a proper value is needed to keep good balance between file size and video quality. It is better to keep bit rate between 1400 and 2000 kbps. Then click "RUN" button to start compressing WMV file. The WMV video file size shrink process will be done speedily. Another Way to Shrink WMV File Size without Compression. This is still another video size reducer to decrease WMV file - Windows Movie Maker. You just go to the Start Menu and open WMM, after which you can load WMV video by hit Import video; to go File and click on Save Movie File; save the file by selecting the location in your windows computer; select the Other settings from the Movie Setting window; tap video for broadband (340 kps); here we go you will get the output WMV file. Best way is shared with you to easily convert 30p to 24p for faster uploading video to YouTube, Facebook, Vimeo, etc. Two ways to free convert WMV video to MP4 on macOS (Mojave). Best free MP4 converter for u to convert WMV to MP4 for play on iPhone iPad Android or editing in iMovie, Final Cut Pro, etc. Here's how to fast shrink MP4 online without losing quality but with high online MP4 file compression ratio to email faster, upload to YouTube, FB, or to free up disk space and iPhone iPad Android space etc. MacX Video Converter Pro offers you the simple yet all-round way to compress and reduce MP4 file size to AVI, FLV, WMV and more smaller-sized formats. Also losslessly resize MP4 file size with parameter adjustment and video editing features.